This impostor has been sharing slanderous, fictitious news reports and videos about recent court hearings involving Syntek Global. These statements are false. 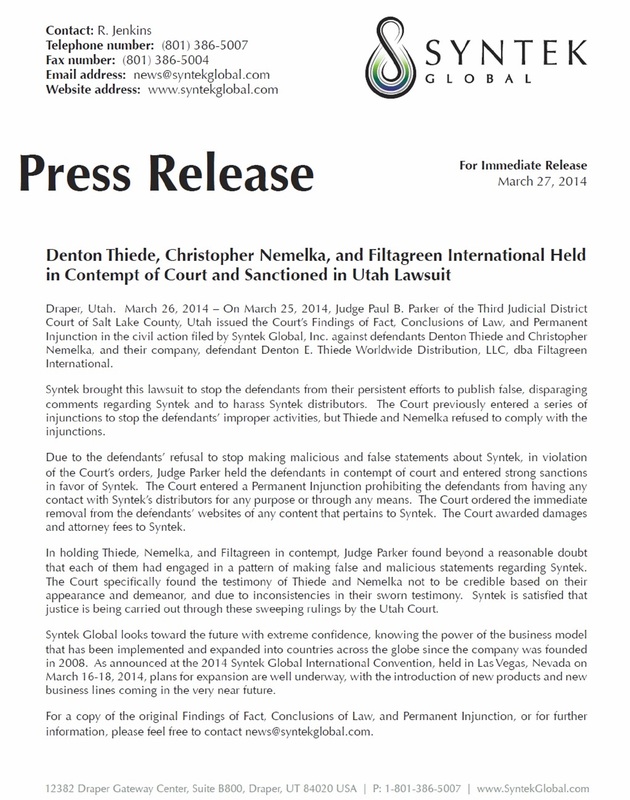 The judge in the court case filed by Syntek Global has held the defendants (Denton Thiede, Christopher Nemelka, and their company) in contempt of court and has sanctioned them for making false statements similar to those posted in the name of “Janicka Fox.” The judge has entered a permanent injunction prohibiting Thiede, Nemelka, and those working with them from ever having any contact whatsoever with Syntek Global distributors, even using a fake identity like “Janicka Fox.” Syntek Global has nothing to hide. All of the court proceedings are a matter of public record for anyone to read. This entry was posted in News, Syntek Global and tagged Christopher Nemelka, court case, Denton Thiede, fake, fictitious, Filtagreen, Filtagreen International, Janicka Fox, syntek global. Bookmark the permalink.